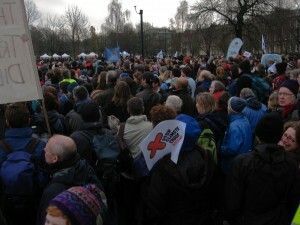 The main aim of many of us who went to Copenhagen was to take part in the Reclaim Power march on Wednesday 16th December. 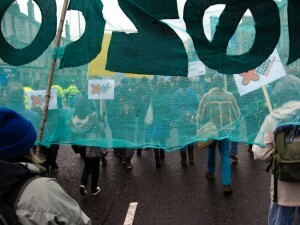 The aim of the march was to create a people’s summit inside the Bella Centre where the conference was taking place in order that the people of the world could have their say. With negotiations inside being dogged by false solutions, weak promises and the agenda dominated by the rich polluting countries, it was felt by all that exposing the sham talks and presenting positive solutions to the world was a vital reason for being in Copenhagen. 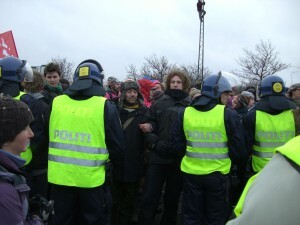 Some people were nervous about possible confrontations with the police – the aim of the march was non violent but confrontational, as the aim was to push past the police lines and enter the Bella Centre to create an alternative space. 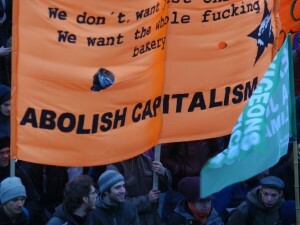 However, with the mainstream media ignoring the voices of the majority world and failing to highlight the need for radical system change in order to solve the crisis, many of us felt that confrontational was not only necessary but inevitable. The march was organised into several blocks, each of which was to converge on the Bella Centre. One block included delegates and NGOs from inside the Bella Centre who came out in solidarity to join those of us coming from the outside. This block was stopped from joining us and forcibly beaten back by riot police using batons. When they tried to return to the bella Centre they were refused entrance. 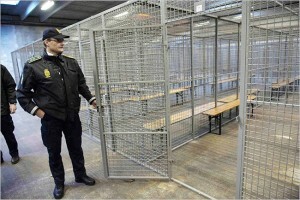 Another block of 200 protestors were simply mass arrested and held in metal cages in freezing conditions for around 6 hrs. We took part in the main block consisting of around 5000 activists which met at Tarnby train station at 8am and proceeded to march to the Bella Center. The police took an aggressive stance all the way there continually trying to drive vans into the main block of protestors and repeatedly pushing and shoving people. From time to time undercover police dragged out people from within the crowd and arrested them for no apparent reason. 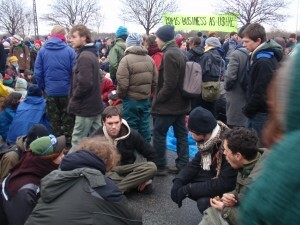 In response we all formed a chain around the block of protesters to prevent police from invading and pushing us. Several of the cumbrian contingent forming part of a human chain around the main block of protestors. 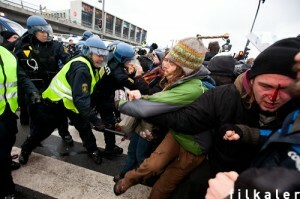 As we arrived at the Bella Center the situation changed dramatically. The police split the march in two and immediately began an aggressive action of pepper spraying the crowd and using batons to beat people back. 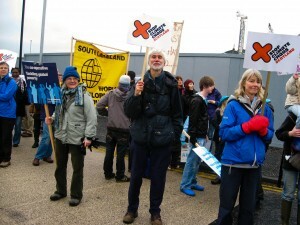 Several of us Cumbrians ended up in a main block where the people’s summit took place, whilst the remander were split across the police lines. Two members of our party were pepper sprayed and had to receive treatment by activist medics. Police using batons to beat back protestors. A protestor receiving treatment by activist medics after being pepper sprayed by police. Despite the police violence several protestors manage to make it into the Bella Centre compound. A makeshift bridge of inflatable beds was constructed and used to cross a canal to gain entrance into the compound. Activists use a bridge constructed from inflatable beds to enter the Bella Centre compound, but are immediately met by riot police, pepper spray and dogs. A large group of around 2000 protestors held the street while all this was going on. Despite several baton charges by police protestors managed to hold the area and the people’s summit went ahead as planned. 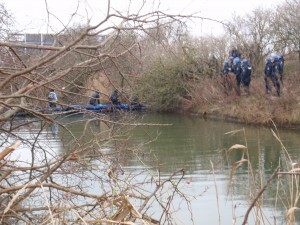 Eventually the police seemed to calm down and formed a chain around us but kept their distance. Eventually the police calmed down and kept their distance. 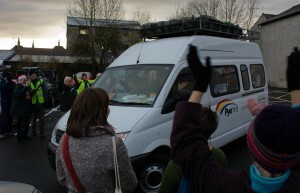 The people summit took place on the road by the Bella Centre. People broke into groups to discuss real solutions to the climate crisis. 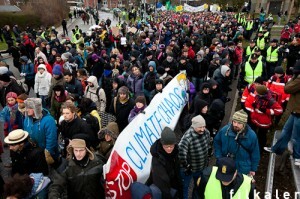 Eventually, after several hours, a few thousand protestors marched back into Copenhagen, reaching the city centre at around 8pm. 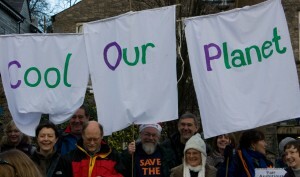 The day had gained wide publicity and helped to push the alternative climate justice agenda into the mainstream. 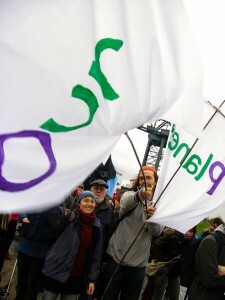 Whilst we were all pretty exhausted after a very long day, we felt that confronting those in power with the truth that radical system change is the only real answer to the climate crisis was a necessary step, and that this was just the beginning of the birth of a global movement to stop the climate crisis. We all felt that we needed to do more at home to spread the message and that we needed to meet up when we return to discuss what we should do about it. The Magnificent 15! hope to get back to Kendal tomorrow after a long journey fraught by snow, a broken down mini bus and delays. 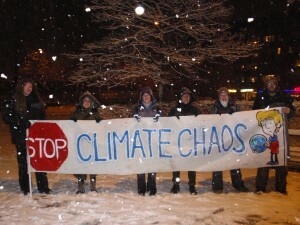 The group have spent a week in Copenhagen, outside in sometimes minus 10 conditions calling for a safe future for us and our children. Despite global protests and awareness raising, current World leaders have produced a mere political statement with no legally binding targets for countries to reduce their emissions. At a time when increasingly regular floods, drought, biodiversity loss, desertification, sea level rise etc threaten the livelihoods of billions around the world, particularly those most vulnerable living in the global South, this is a poor outcome to such an historic opportunity for nations to work together on a comprehensive, equitable and binding agreement to try to prevent catastrophic climate change. Click below to sign the petition for a real deal in Copenhagen — the campaign already has a staggering 10 million supporters – let’s make it the largest petition in history in the next 72 hours! Every single name is actually being read out at the summit — sign on at the link below and forward this to everyone! The Magnificent 15 crossed the border into Copenhagen about an hour ago after a safe journey across on the ferry. They will join thousands from around the world calling for climate justice for all. 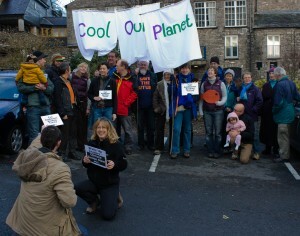 Yesterday at the Brewery Arts Centre in Kendal around 30 people gathered to show their support for a group of 15 Cumbrians travelling to Copenhagen to join those calling for a strong effective global deal for climate justice. We hope the group will represent us in Copenhagen through non violent action raising awareness of the need for a strong, equitable and binding treaty to reduce greenhouse gas emmissions and help vulnerable countries in the Global South to adapt to changing climates. A strong outcome from the current COP15 Summit is critical for the world’s future. To follow the groups progress, check back to this blog. Last Saturday a brave coach load of Cumbrians took to the streets of Glasgow to demonstrate thier desire for a fair, ambitious and binding treaty to be signed at the Copenhagen summits this week. Thousands lined the streets in a huge wave of people calling for climate justice for all. Climate change affects us all. While we can’t be 100% sure that any particular extreme weather event is attributable to climate change, the unprecedented levels of rainfall in Cumbria in recent weeks, and their tragic results, are completely coherent with the predicted consequences of climate change. Unless we take robust and urgent action on personal, political and professional levels we can expect such events to happen with increasing frequency. We need action now for a real deal for climate justice. Yesterday 56 newspapers in 45 countries took the unprecedented step of speaking with one voice through a common editorial. We do so because humanity faces a profound emergency. You are currently browsing the archives for the Copenhagen COP 15 Dec 2009 category.